Arcad Chemicals manufactures a complete solution of mold release, starts with mould cleaner to sealing pastes till mould release agents for all types of polyurethane molding! The polymers known as polyurethanes include materials that incorporate the carbamate group, NHCOO , as well as other functional groups, such as ester, ether, amide, and urea. The name polyurethane is derived from ethyl carbamate, known as urethane. Polyurethanes are usually produced by the reaction of a polyfunctional isocyanate with a macroglycol, a so-called polyol, or other reactants containing two or more groups reactive with isocyanates. Often a combination of a macroglycol and a short-chain glycol extender is used to produce segmented block copolymers. The macroglycols are based on polyethers, polyesters, or a combination of both. In recent years diamines have also been used as comonomers in order to achieve higher reaction rates in molding and spray applications. In addition to the linear thermoplastic polyurethanes, obtained from difunctional monomers, branched or cross-linked thermoset polymers are made with higher functional monomers. Linear polymers have good impact strength, good physical properties, and excellent processibility, but limited thermal stability (owing to their thermoplasticity). Thermoset polymers, on the other hand, have higher thermal stability but sometimes lower impact strength (rigid foams). The higher functionality is obtained with higher functional isocyanates (polymeric isocyanates), or with higher functional polyols. Cross-linking is also achieved by secondary reactions. For example, urea groups are generated in the formation of water-blown flexible foams. An isocyanato group reacts with water to form a carbamic acid, which dissociates into an amine and carbon dioxide, with the latter acting as a blowing agent. The amine reacts with another isocyanate to form a urea linkage. Further reaction of the urea group with the isocyanate leads to cross-linking via a biuret group.Waterblown flexible foams contain urethane, urea, and some biuret groups in their network structure. Urea-modified segmented polyurethanes are manufactured from diisocyanates, macroglycols, and diamine extenders. Polyurethane network polymers are also formed by trimerization of part of the isocyanate groups. This approach is used in the formation of rigid polyurethane-modified isocyanurate (PUIR) foams. The addition polymerization of diisocyanates with macroglycols to produce urethane polymers was pioneered in 1937 by O. Bayer (1). The rapid formation of high molecular weight urethane polymers from liquid monomers, which occurs even at ambient temperature, is a unique feature of the polyaddition process, yielding products that range from cross-linked networks to linear fibers and elastomers. The enormous versatility of the polyaddition process allowed the manufacture of a myriad of products for a wide variety of applications. The early German polyurethane products were based on tolyene diisocyanate (TDI) and polyester polyols. In addition, a linear fiber, PerlonU,was produced from the aliphatic 1,6-hexamethylene diisocyanate (HDI) and 1,4-butanediol. Commercial production of flexible polyurethane foam in the United States began in 1953. In Germany a toluene diisocyanate consisting of an isomeric mixture of 65% 2,4-isomer and 35% 2,6-isomer was used in the manufacture of flexible foam, whereas in the United States the less expensive 80:20 isomer mixturewas used. In 1956, DuPont introduced poly(tetramethylene glycol) (PTMG), the first commercial polyether polyol; the less expensive polyalkylene glycols appeared by 1957. The availability of the lower cost polyether polyols based on both ethylene and propylene oxides provided the foam manufacturers with a broad choice of suitable raw materials, which in turn afforded flexible foams with a wide range of physical properties. Polyether polyols provide foams with better hydrolytic stability whereas polyester polyols give superior tensile and tear strength. The development of new and superior catalysts, such as Dabco (triethylenediamine) and organotin compounds, has led to the so-called one-shot process in 1958, which eliminated the need for an intermediate prepolymer step. Prior to this development, part of the polyol was treated with excess isocyanate to give an isocyanateterminated prepolymer. Further reaction with water produced a flexible foam. The late 1950s saw the emergence of cast elastomers, which led to the development of reaction injection molding (RIM) at Bayer AG in Leverkusen, Germany, in 1964. Also, thermoplastic polyurethane (TPU) elastomers and Spandex fibers were introduced during this time. In addition, urethane-based synthetic leather was introduced by DuPont under the trade name Corfam in 1963. The late 1950s also witnessed the emergence of a new polymeric isocyanate (PMDI) based on the condensation of aniline with formaldehyde. This product was introduced by the Carwin Co. (later Upjohn and Dow) in 1960 under the trade name PAPI. Similar products were introduced by Bayer and ICI in Europe in the early 1960s. The superior heat resistance of rigid foams derived from PMDI prompted its exclusive use in rigid polyurethane foams. The large-scale production of PMDI made the coproduct 4,4_,-methylenebis(phenyl isocyanate) (MDI) readily available, which has since been used almost exclusively in polyurethane elastomer applications. Liquid derivatives of MDI are used in RIM applications, and work has been done since the 1990s to reinforce polyurethane elastomers with glass, graphite, boron, and aramid fibers, or mica flakes, to increase stiffness and reduce thermal expansion. The higher modulus thermoset elastomers produced by reinforced reaction injection molding (RRIM) are also used in the automotive industry. In 1969 Bayer pioneered an all-plastic car having RIM-molded bumpers and fascia; in 1983 the first plastic-body commercial automobile (Pontiac Fiero) was produced in the United States. The polymerization step can be conducted in a mold, in an extruder (TPU production), or continuously on a conveyor (block foam production). Also, spraying of the monomers onto the surface of a substrate produces polyurethane coatings. The resulting polymers can be thermoplastic, which allows reprocessing by injection molding, extrusion, blow molding, and other remelting processes, or they are thermoset polymers as used in the RIM process in the molding of automotive bumpers, or in the manufacture of cellular polyurethanes. Polyurethanes are a primary component of the global polymer market. They amount to about 6% of the total world plastic use. The world consumption of polyurethanes in 2000 was about 8 million tons, with a global growth averaging around 3–4% a year. The Western Hemisphere uses about 3 million metric tons per annum, Western Europe approximately 2.6 million metric tons per annum, the remainder being used in Asia and Africa. Today’s global polyurethane industry has been reshaped by several mergers of the 1980s and 1990s. Some of the familiar players, such as ICI, Upjohn, Olin, Rhone Poulenc, Union Carbide, and Arco, sold their polyurethane businesses; Bayer, the principal global isocyanate producer, strengthened its position in polyether polyols by acquiring the Arco polyol business in 1999. Also Dow, the other leading producer of polyether polyols, acquired Union Carbide in 1999, which further strengthened its position in polyols. The primary polyurethane players of the new millennium are Bayer, BASF, Dow, and Huntsman, the latter through the purchase of the global ICI business. Lyondell, which acquired the TDI businesses from Olin and Rhone Poulenc, sold the Arco polyol business to Bayer in 1999, thereby indicating their intent to eventually exit polyurethanes. Over the years the primary polyurethane chemical producers underwent forward integration by buying primary polyurethane system houses, ie their principal customers. Recent examples include the acquisition of Essex, a leading producer of automotive windshield adhesives and sealants, and of Flexible Products and General Latex, which are polyurethane foam system houses, by Dow; and BASF acquired IPI International, a producer of insulation foam systems. in 2000. In this plant feedstock from Dows Estarreja, Portugal, plant is separated into PMDI and MDI. Although distillation plants are less costly, the other primary producers seem to be involved in building global-size facilities in Asia. For example, BASF plans to build a new 140-kt/a TDI plant in Yosu, South Korea by 2003. A present MDI plant at this site will be simultaneously expanded to 160 kt/a. Also, several major facilities are planned for mainland China. A recent project by Bayer, the building of a major TDI plant in Taiwan, was cancelled because of local opposition to the plant. Enichem in Italy, which acquired its isocyanate technology from ICI, is a regional producer of isocyanates and polyols. The major producers of polyurethane chemicals also manufacture TPU elastomers. DuPont was also at one time involved in polyurethanes, but it sold its TDI technology to Dow and excited the synthetic leather business. However, DuPont is still the principal force in the production of polyurethane fibers (Lycra). Through the acquisition of Uniroyal and Witco, the Crompton & Knowles Corp. became a principal force in polyurethane elastomers, which are now sold under the trade nameCKWitco. Manufacturing and marketing arrangements include a rigid foam system marketing deal between Huntsman and Shell, and a manufacturing joint venture of BASF and Shell. The latter is named Basell CV, which opened a new styrene monomer/propylene oxide plant at Moerdijk in the Netherlands with a capacity of 250 kt/a of propylene oxide. Another plant in Singapore is scheduled to open in 2002. Some of the new polyols are used to supply Huntsman, which is the only primary polyurethane company without a polyol manufacturing capability. One of the current trends in polyurethanes is the gradual replacement of TDI by the less volatile PMDI or MDI in many applications. The production of PMDI/MDI is a coproduct process, which is economically viable because the market requires amounts of both isocyanates in the amounts presently produced. 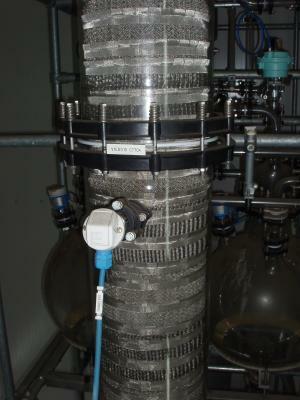 All primary producers remove some of the higher priced MDI (up to 50%) by vacuum distillation. A process for the manufacture of only MDI does not exist. Elimination of chlorinated fluorocarbon (CFC) blowing agents and the reduction of emission of volatile organic compounds (VOCs) have been ongoing. The latter leads to a rapid increase in the use of water-based polyurethane dispersions in coating applications. Flexible foam producers have eliminated auxiliary blowing agents, and the rigid foam producers use water-blown formulations in combination with hydrochlorofluorocarbons (HCFCs), hydrofluorocarbons (HFCs), or hydrocarbons. Adhesives and sealants are reformulated from solvent-based products to 100% solid-and water-based systems. The synthesis, reactions, and manufacture of isocyanates were reviewed in 1997 , and the chemistry and technology of isocyanates is the subject of a recent book. The standard method of synthesis of isocyanates is the phosgenation of amines or amine salts. The phosgenation of amines to isocyanates was pioneered by Hentschel in 1884 (4). Using this method, a solution of the diamines in chlorobenzene is added to excess phosgene in the same solvent below 20◦C. The resultant slurry consisting of the dicarbamoyl chloride and the diamine dihydrochloride is treated with excess phosgene at temperatures up to 130◦C. Upon heating above 65◦C the dicarbamoyl chloride dissociates to generate diisocyanate. The conversion of 2 is very slow, and the use of polar solvents or higher pressures increases the rate of reaction. In the laboratory a slurry of the diamine salts, obtained by treating a solution of the diamines with hydrogen chloride or carbon dioxide, is treated above 100◦C until a clear solution is obtained. Instead of the toxic phosgene gas, the liquid trichloromethyl chloroformate (diphosgene) (5) or the solid bistrichloromethyl carbonate (triphosgene) (6) can be used in the laboratory. The phosgene oligomers have to be used with caution because the toxic monomer can be generated readily and all reactions have to be performed under a fume hood. In the continuous manufacture of diisocyanates, the by-products (hydrogen chloride and excess phosgene) are vented and separated. The recovered phosgene is recycled and part of the hydrogen chloride is used in the aniline/formaldehyde condensation. The solvents used in the phosgenation of the diamines are aromatic hydrocarbons, especially chlorobenzene and o-dichlorobenzene. Occasionally, more polar solvents, such as ethyl acetate, dioxane, nitrobenzene, or dimethylsulfone, are used. Excess phosgene can also be used as solvent if the reaction is conducted under high pressure. Dimethylformamide (DMF) and phenyltetramethylguanidine catalyze the phosgenation reaction. Aliphatic diamines are also phosgenated in a two-phase reaction using methylene chloride and aqueous sodium hydroxide. The diamine and phosgene are dissolved in methylene chloride and the form 2 is instantaneously neutralized with sodium hydroxide. The generated diisocyanate remains in the solvent phase, and excess phosgene is also neutralized with sodium hydroxide, which enhances the safety of phosgene handling. The highly exothermic reaction requires efficient cooling. A disadvantage of this process is the use of a slight excess of phosgene, which cannot be recovered. Instead of phosgene and its oligomers, oligomeric t-butylcarbonates are also used to convert diamines into diisocyanates. For example, sterically hindered aromatic diamines react with di-t-butyldicarbonate in the presence of dimethylaminopyridine in acetonitrile at room temperature to give sterically hindered aromatic diisocyanates. In this manner 3,6-3_,6_-tetramethyl MDI is obtained in 93% yield (8). Also, aliphatic diamines react with di-t-butyltricarbonate at room temperature to give a high yield of the corresponding diisocyanates. Since the early 1970s, attempts have been made by the principal global producers of isocyanates to avoid the use of the toxic phosgene in the manufacture of isocyanates. Attempts to produce TDI and PMDI by nonphosgene processes have failed. However, two aliphatic diisocyanates, CHDI and TMXDI, are manufactured using nonphosgene processes. H¨ uls and BASF have also announced plans to use nonphosgene processes for the manufacture of IPDI in their new plants which are under construction. In the new, nonphosgene chemistry, isocyanic acid, generated by thermolysis of urea, reacts with diamines to give a bis-urea derivative. Subsequent reaction with diethylamine affords tri-substituted urea derivatives, which are thermolyzed in an inert solvent in the presence of an acidic catalyst to give the diisocyanate (10). 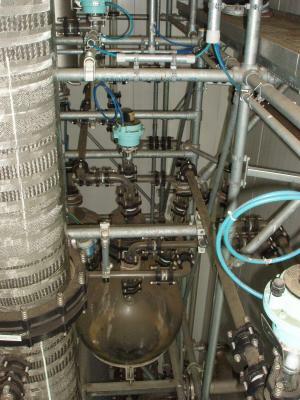 Gaseous ammonia is the only by-product in this process. Also, reaction of aliphatic diamines with carbon dioxide, in the presence of triethylamine, affords biscarbamate salts, which can be dehydrated with phosphoryl chloride to give the diisocyanate. Another laboratory method of synthesis of diisocyanates is the thermolysis of bisacylazides (Curtius reaction). For example, dicarboxylic acid chlorides react with trimethylsilyl azide to give (4), which is thermolyzed in an inert solvent to give the diisocyanates , n = 3–10 . The preparation of aliphatic diisocyanates, using bisacylazides, has to be conducted with caution because an explosion occurred in the preparation of ethylene diisocyanate by using this method. Ethylene diisocyanate is readily obtained by dehydrochlorination of a heterocyclic allophanoyl chloride derivative obtained in the phosgenation of ethyleneurea. The commodity aromatic isocyanates TDI and PMDI/MDI are most widely used in the manufacture of urethane polymers. Tolylene diisocyanate, TDI, is a distilled 80:20 mixture of 2,4- and 2,6-isomers. However, pure 2,4-TDI and a 65:35 mixture of the 2,4- and 2,6-isomers are also commercially available. Pure 2,4- TDI, mp 19.5–21◦C, is obtained on cooling of 80:20 TDI. The manufacture of TDI involves nitration of toluene, hydrogenation to the diamines, and phosgenation. Separation of the undesired ortho derivatives, such as 2,3- and 3,4-dinitrotoluene, is necessary because their presence interferes with the polymerization of TDI. The other commodity isocyanate, PMDI/MDI, is based on benzene. Mononitration of benzene, catalytic reduction to aniline, followed by condensation of aniline with formaldehyde produces oligomeric amines, which are phosgenated to give mixtures of PMDI and MDI. 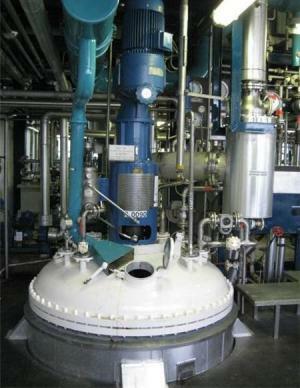 MDI is separated from PMDI by continuous thin-film vacuum distillation. PMDIs are crude products that vary in exact composition. The main constituents are 40–60% MDI; the remainder is the other isomers of MDI, triisocyanates, and higher molecular weight oligomers. Important product variables are functionality and acidity. Rigid polyurethane foams are mainly manufactured from PMDI. The so-called pure MDI is a low melting solid that is used for high performance polyurethane elastomers and spandex fibers. Liquid MDI (Isonate 143-L) is produced by converting some of the isocyanate groups in MDI to carbodiimide groups, which react with the excess isocyanate present to form a small amount of the trifunctional four-membered ring cycloadduct . The presence of the cycloadduct lowers the melting point of MDI to give a liquid product. In most applications the trifunctional cycloadduct will dissociate into difunctional monomers; therefore, this type of liquid MDI can be used in the manufacture of linear polyurethanes. Liquid MDI products are also made by reaction of the diisocyanate with small amounts of glycols. These products are called prepolymers. MDI products enriched in 2,4-MDI are also available. The latter are used in the manufacture of flexible MDI foams. The manufacture of the oligomeric amine precursors for PMDI/MDI is conducted by continuously adding formaldehyde to aniline in the presence of less than the stoichiometric amount of hydrochloric acid at room temperature in agitated reactors. The reaction mixture is gradually heated to 100◦C over a period of several hours. The reaction can also be conducted under pressure at higher temperatures in order to increase the rate of reaction. However, the oligomeric amines produced in this manner contain higher amounts of 2,2_- and 2,4_-methylenedianiline (MDA). The acid-catalyzed aniline/formaldehyde reaction proceeds in two steps. At room temperature aniline reacts with formaldehyde to form N-substituted carbonium ions which attack aniline in the para- and ortho-position to give a mixture of p-aminobenzylamine (PABA), o-aminobenzylamine (OABA), and oligomeric benzylamines. Subsequent heating affects dissociation of the benzylamines to give C-bonded carbonium ions, which form another C C bond in their reaction with aniline. The variables affecting the product distribution are aniline concentration, hydrochloric acid concentration, and temperature. The higher the excess of aniline, the higher is the diamine concentration. Higher hydrochloric acid concentration and lower initial temperature favor the formation of 4,4_-MDA. Attempts were made over the years to replace the aqueous hydrochloric acid catalyst with slower reacting solid acidic clay catalysts, but the obtained product distribution was different, and therefore this approach was never used. The commercial manufacture of TDI and PMDI/MDI is the continuous phosgenation under pressure of the amine precursors in an inert solvent at elevated temperatures. The by-products, hydrogen chloride and excess phosgene, are continuously vented and separated. The recovered phosgene is recycled and the hydrogen chloride is used in the aniline/formaldehyde condensation, or it is sold or reoxidized to chlorine to be reused in the manufacture of phosgene. 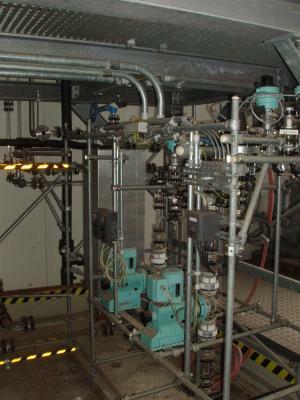 In case of the manufacture of PMDI, some of the diisocyanate (MDI) is separated by continuous vacuum distillation using a wiped film evaporator. In this operation the residual PMDI, which still contains MDI, is only subjected to a short heat treatment. The advantage of the simultaneous manufacture of both isocyanates is a quantitative yield because the by-products of the phosgenation reaction are contained in the residual PMDI. 2.10; PMDI: 2.0; MDI: 2.3. The light-stable aliphatic isocyanates are somewhat more expensive. Several higher-priced aromatic diisocyanates, such as p-phenylene diisocyanate (PPDI), 1,5-naphthalene diisocyanate (NDI), and bitolylene diisocyanate (TODI), are also available. These symmetrical high melting diisocyanates give high melting hard segments in polyurethane elastomers. Polyurethane products first made their appearance in the market place in the late 1930’s. This was after an intensive investigation by Dr Otto Bayer who was looking for a synthetic fibre to replace nylon. Once the basic technology was understood, new applications for foams (1941) and elastomers (1943) were developed. In the early 1950’s, commercial applications appeared. The variety of raw materials as well as the range of different manufacturing techniques enabled pioneers to make a seemingly endless range of tailor-made products with different physical properties. These included soft foams, rigid structural and insulation foams, soft and hard elastomers and coatings. Processing techniques include casting, spraying, foaming, reaction injection moulding, injection moulding, extrusion and painting. Polyurethane is a name that is given to resins that contain urethane groups. The urethane groups in the molecule give the end product certain unique properties. The component containing the hydroxyl groups is referred to as the Polyol component and the component containing the ISOcyanate groups is referred to as the ISOcyanate (ISO) component. There are a large number of raw materials available and this means that polyurethanes are one of the most versatile products on the market. Note : Prepolymers are resins where the diisocyanate and polyol have been pre-reacted under carefully controlled conditions.